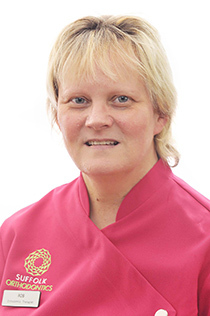 Ros qualified as a dental nurse in November 1983, working in dental practices in Plymouth. She moved to Suffolk in February 2002, where she worked for the Community Dental Service assisting with special needs, medically compromised and phobic patients, also general anaesthetics and orthodontics. She qualified as an Orthodontic Therapist in June 2012, studying on the South Wales Orthodontic Therapist Course, graduating at The Royal College of Surgeons London, gaining the Diploma in Orthodontic Therapy. In her spare time, Ros enjoys walking her 2 Pugs Toby and Betsy, going to the cinema and music.